* The author of this post does not recommend sake-drinking to anyone who has not reached the legal drinking age or who should not consume alcohol due to medical/psychological concerns. Now as an adult, I enjoy sake once in a while, but until recently I always drank the same local brand, Tosazuru 土佐鶴, non-expensive, regular version (futsu shu) only. And when I go out with my friends, usually sake is not my first choice of drink. After all, beer and cocktails are far more commonly served at parties and karaoke places. It is only recently that I started learning about different types and grades of sake, and exploring my favorite combinations with appetizers. That is why I see myself as a beginner. And it is no surprise that someone who just started exploration to be a fan of “beginners’ favorite” brands. What kind of sake is "beginners’ favorite?" It is said to be light, easy-to-drink type without overpowering aroma or sensation. And this Jozen mizu no gotoshi is one of the brands that experienced drinkers almost always recommend to sake beginners. Oh, please don't take it wrong. 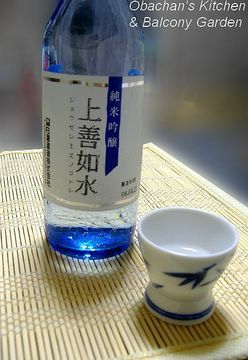 It DOES NOT mean that this is a low-class, bland or boring sake. This is the kind that is considered to be very likely to make non-sake drinkers say, “Hey, actually, sake isn’t bad. I think I like it.” This brand, produced in a northern prefecture, became too popular throughout Japan at one point in the past, so that probably coined the image of this sake as "everyone's favorite" or “beginners’ favorite.” The name, Jozen mizu no gotoshi came from the philosophy of Taoism (See Verse 8. Water). Today I tried it chilled first, then warmed to body temperature. (Well, not sure if it was really body temperature because I don’t have a cooking thermometer). It was pretty easy to drink when chilled, and I liked it even better when it was slightly warmed. 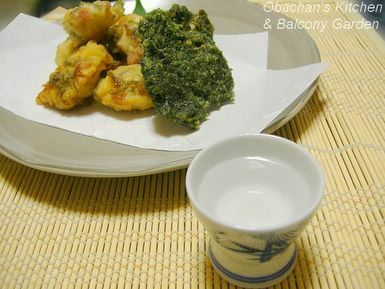 Accompanying appetizers tonight were sasami no ume-shiso ten (batter-fried chicken breast fillet with pickled plums and green perilla) and aonori ten (batter-fried green laver). Actually the former was included in our ex-izakaya menu, and the latter is one of the side dishes we offer at our kaiseki place now. The izakaya version of ume-shiso ten had ume paste and shiso leaves rolled in cut-opened chicken fillets. 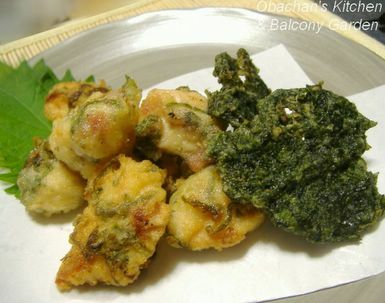 But my version is a lot simpler; I just minced seeded umeboshi (pickled plums) and shiso, mixed them with chicken chunks, dipped them in batter and deep-fried. 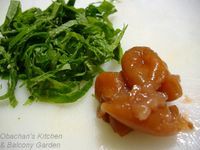 I like it that way because it is easier than rolling and it makes the taste of ume a lot milder. I guess you can use white fish in place of chicken breast fillet. 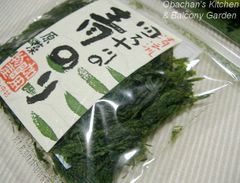 Some people may not like this aonori-ten at all, because it does smell fishy. But let me emphasize this: it is not an unpleasant fishy smell of cheap seaweed. 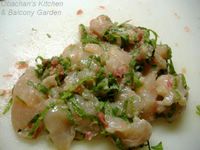 It is much lighter and fresh, which I think deserves a description such as "amazingly flavorful" rather than just "fishy." This tempura is also very easy to make. 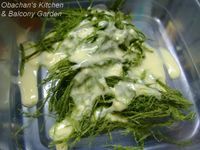 All you have to do is pour a little batter over the green laver and mix, take a little portion of it and flatten with fingers, then drop it in hot oil to deep fry. It is very important to make it as flat as possible so that it turns out pleasantly crunchy. This Jozen mizu no gotoshi went so well with bosh kinds of tempura; It didn’t mess with the strong flavors of ume, shiso and green laver at all. My assumption is that this sake will go well with most foods, creating pleasant harmony, or at least not overpowering anything. And that is where its name came from -- the supreme good described in the verse 8 of Tao Te Ching. I like it. I like it very much. 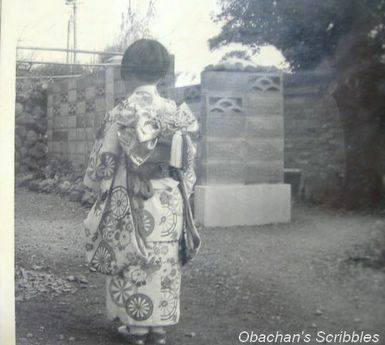 You do look cute on this childhood picture! Your blog is so cute. I love looking at all the lovely things you make. I am just a beginner in Japanese cooking and unfortunately in America... so I've been very limited to what I can make. What I'm looking into most right now are vegetable cutters (or any other cute cutters). They make dishes look so much nicer. I was wondering what that would be called in Japanese (whether or not cutter would be a katakana word) or if you know any sites that sell interesting ones like ginkgo or maple leaf cutters (if it isn't a bother). Thank you very much! Thanks for the tip on beginner's sake. I've never actually tried it as a drink although I sloshed a cooking grade one in food once. The dinner with your sake looks amazing too. It looks like it would really satisfy! Over here, they used to say that high grade sake like ginjo-shu or daiginjo-shu should be served either slightly chilled or at room temperature, but should never be warmed. But it’s changing these days. They found that some (not all) ginjo or daiginjo-shu taste good when slightly warmed, and now we can find some sake bottles with tags that tell us whether warming is recommended or not. I guess they are called “yasai nuki gata” in Japanese. This site has vegetable cutters which I think you can order online. This site calls them “kata nuki,” but I don’t know if you can order them online or via email. Here in Japan, we can buy a lot cheaper ones at the Daiso 100-yen shop. They are like 2 or 3 of them for 100 yen (apx.1 USD). In the past they didn’t have elaborate shapes like maple and ginkgo leaves, but now those seem to be available there, too (which made me furious, because I bought those two kinds of cutters for ridiculously expensive prices last year!!) If you live or have friends living close to Daiso USA, you might want to try that place, too.